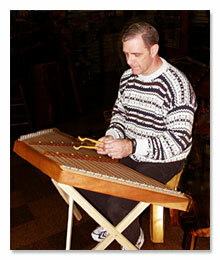 With over 20 years experience playing and teaching hammered dulcimer, Rich Carty is beginning a new career as “The Dulcimer Guy.” A multi-talented musician who is comfortable playing in a variety of styles, Rich has a large repertoire from which to draw for his performances, including weddings and music for the Christmas season. Rich's instrument — the hammered dulcimer — is an unforgettable solo instrument, but blends equally well as half of a duo, or as a special voice within a group. In fact, you may already have seen and heard Rich as The Dulcimer Guy almost anywhere within southern New Jersey — perhaps performing as part of a regional fair, or during candlelight holiday shopping evenings in Haddonfield, Celtic music events, during weddings, at restaurants and coffee houses. Rich would be a very special addition to your next family or group program. And he is available for bookings at coffee houses, restaurants and other venues. • High resolution black & white photo (444 KB, 300 ppi photo); suitable for printing in flyers, brochures, etc. Contact Rich by email or phone (609-518-7600) — or stop in at Pinelands Folk Music Center and discuss your event with him in person.